Sage recently released their Sage Payroll RTI (Real Time Information) this allows for the reform being introduced by HMRC which will require regular submissions rather than the current Year End submission. Every business will need to move to this format by October 2013. Please be aware that the software is not currently compatible (or Supported) with Sage 200. Sites that have installed this software on to a machine running Sage 200 have identified a conflict with Sage 200 Report Designer. The EC Sales list is only an XML file output, so that it is ready for submission to HMRC. 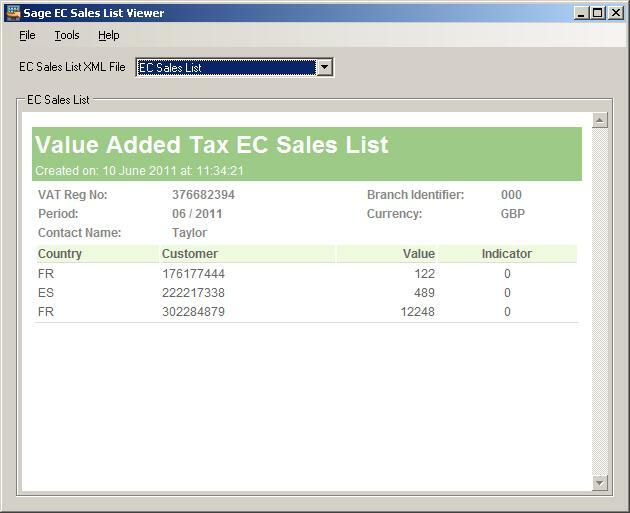 Business Partners are able to download an EC Sales list viewer which will allow you to show the details of the xml file with in a screen. The viewer works as a separate executable. You set up where the XML files are saved and the viewer reads them from there. The drop down list allows you to select the relevent file to be viewed. Within the viewer it is also possible to print the details, export to CSV and validate the file. I am not sure why it isn’t a standard part of Sage 200 or at least shipped with the product, but it is a must for all EC Sales list users.